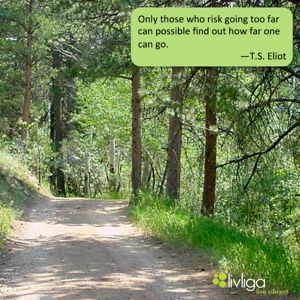 Livliga® Live Vibrant Blog: Great Healthy Living Quote #157-- How far can you go? Livliga’s blog is a weekly dose of inspiration for those looking to embrace the Livliga lifestyle. Founder Sheila Kemper Dietrich is committed to the journey of better living and a healthier lifestyle; this includes sharing personal experiences, new knowledge, and workable solutions along the way. Great Healthy Living Quote #157-- How far can you go? How much of a risk taker are you? Diabetes Meal Plan- Spring Edition from NEW Diabetes eCookbook! Live Vibrant and Enjoy Livliga! You Ate Lay's Potato Chips--Now What!?! People are Lovin’ their LivSpoons! Green Coffee Beans--good for weight loss? The Fat Flush Cookbook by Ann Louise Gittleman, Ph.D., C.N.S.